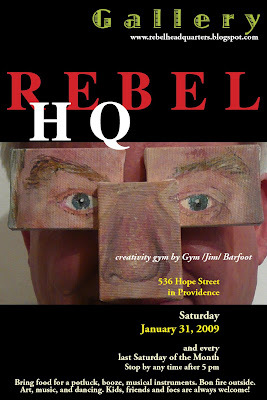 Please join us for the Open House Art Gallery on Saturday, January 31, 2009, starting at 5 pm. This time extraordinary interdisciplinary artist, Jim Barfoot will invite us to the creativity gym of his making! As always Wayne Bridge and Dorota Streitfeld are the accompanying host artists; and Rich Streitfeld is our host of honor and whimsy, bank of information and network advice. All art is offered for sale, discussion, comments and ice breaking. Bring pot luck food, drinks, and musical instruments, if you play. By popular demand we will have a fire pit outside, so hot dogs, franks, wursts, sticks etc. will be nice. As usual kindly forward the invitation to friends and foes! This entry was posted in Uncategorized on January 14, 2009 by dorota.